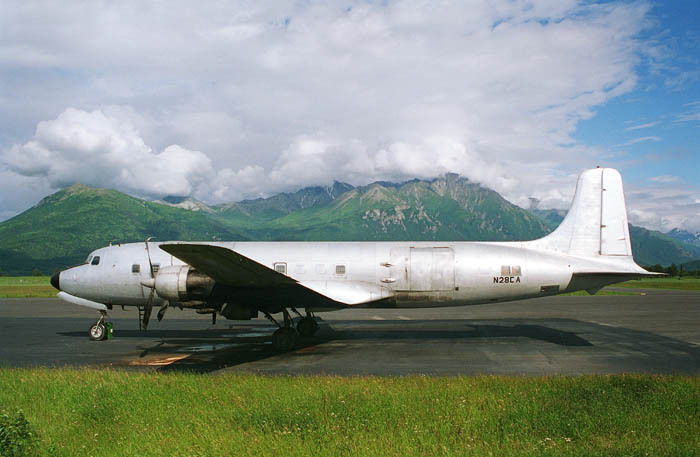 The Douglas DC-6 was considered to be the best in her class, in the 1950s. Of course, in those days, only the Upper Class travelled by air. So their means of transport had to have class as well ! The Pratt & Whitney Double Wasp engines were the most efficient around, the DC-6 was the first Douglas model to have a pressurized cabin, there was space to move around for the passengers and service on board was excellent. Gradually, even the DC-6 was improved, to models -A, -B and -C (improvements on the engines and larger capacity for passengers and freight), while several military variants were developed. N874TA (cn44641/584) is a C-118A Liftmaster, a DC-6 version for the US Air Force and US Navy. It was capable of carrying either 74 people or 12 tons of cargo. And there was a version where it could operate 60 stretchers with wounded. This aircraft was delivered to the USAF in 1955 (as 53-3270), was stored in 1975 at Davis Monthan AFB in Arizona and began it commercial life in 1977 with Rosenbalm Aviation as N96039. 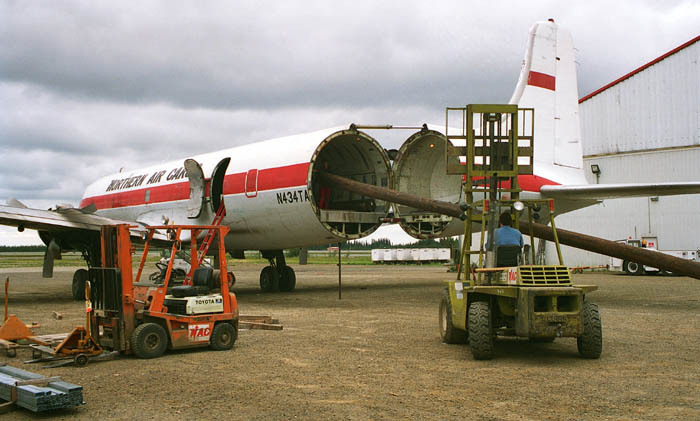 It was converted to carry cargo and Trans Continental Airlines bought it in feb.1978. Then the present user, Trans Air Link, bought it in dec.1986. This photo was taken in feb.1999 at Opa Locka, FL. 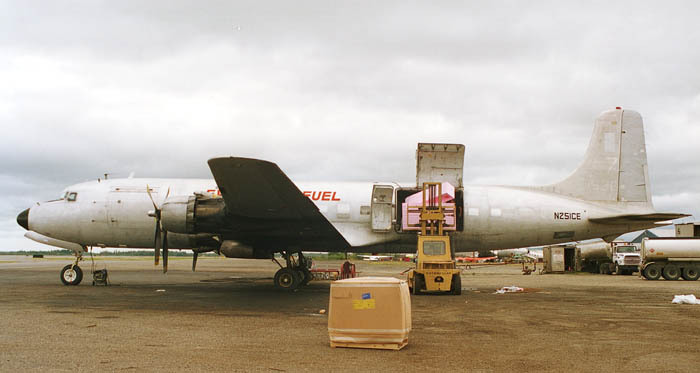 During 2001 N874TA was reported stored at Santo Domingo (Dominican Republic), the same in 2003 but its condition was reported to be good. But that year the airport manager decided to scrap all that stored tired iron and that was the end of N874TA. "ex-Navy and Air Force C-118's are not the same as DC-6A's. The Type Certificate says they are "most like" a DC-6A, but not the same. The Navy R6D became the C-118B which I had to certificate as C-118A's only because the B wasn't listed on the Type certificate. Of course, there were some Air Force A-models which the Navy operated as B-models, which I certificated as A models. There really wasn't much difference between the two; the A or B designation only meant who was operating the plane (resp. Air Force or Navy). However, going back to the beginning when they were C-118A's and R6D's, there was some difference in radios and passenger comfort items. 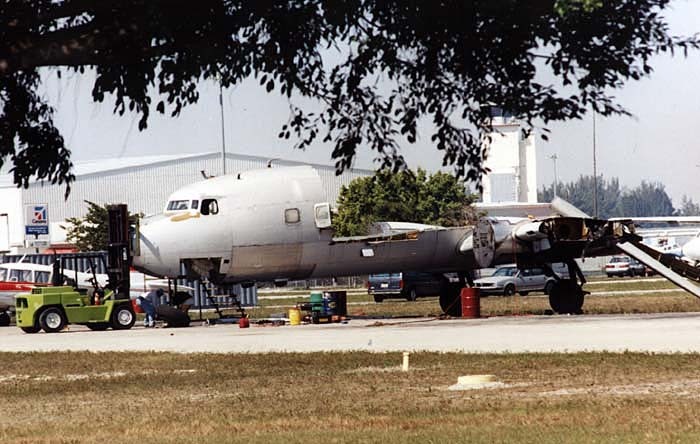 Towards the very end of the Navy Reserve operation of originally Air Force operated C-118's, they didn't redesignate them as B's or give a Navy Buno. Like N351CE is an example of that. It was originally an U.S.A.F. plane that the Navy knew they were only going to operate for less than 2 years, so it flew for the Navy with the A designation and the Air Force serial number! While N251CE, on the other hand, is the other example: the Navy knew they were going to operate her for a number of years so she got the Navy Buno of 153693 and the B designation...."
January, 1956 sent to McGuire AFB, New Jersey. July 1965 sent to the 4600 ABW at Peterson Field, CO.
January, 1975 sent to Davis-Monthan AFB, AZ for storage. September, 1975, dropped from Air Force records as surplus. I was saddened to see her go way back down hill. Thank you for your records and postings. I hope you enjoy the photos. This DC-6 (cn 43522/229) led a varied life: delivered to Pan Am World Airways ("Clipper Pocahontas") in apr.1952 as N6524C. It was leased by Capital Airlines in 1960 and returned to Pan Am in 1961. To be leased again to Aerovias Panama in 19may 1962 as HP-343, for a year. Pacific Airmotive Corp. bought it in jan.1967 . 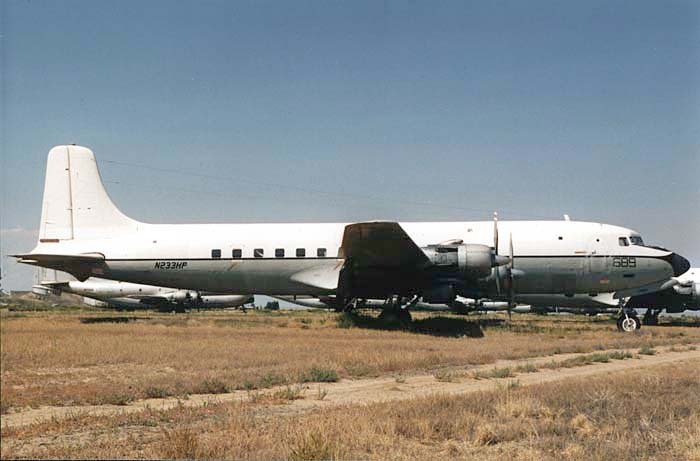 For a new lease on life, it was converted to DC-6A/B in 1967 and went to the US Air Force that same year (66-14467). It was passed on to the the Chilean Air Force and they put 987 on the tail. Atlas Aircraft Corporation purchased it in feb.1982 and registered it as N861TA. While stored at Opa Locka,FL it changed ownership to Freedom Int'l Corp. in may 1984. Then Universal Airlines leased it in june 1984, Northern Pacific Transport bought it in oct.1989 and I photographed it with Woods Air Fuel at Palmer in Alaska in 1995. Still carrying on as N861TA. In the photo the fueltanks can clearly be seen, used for hauling fuel to many of the remote communities in Alaska. Unfortunately, the aircraft crashed when it aborted a take off at McGrath,AK jan.2nd 1998. Buddy Woods died in the crash of DHC-4 Caribou N539Y, on 20Mar86. Karl Hayes wrote an excellent article about Woods Air Fuel in Propliner magazine, no.120, Autumn 2009. There is hardly a place in the world where you can find a backdrop like this, the magnificent scenery of Alaska is all around. (Mind you, the weather in Alaska claims many a victim every year..!) N28CA (cn 45321/934) is a DC-6BF been delivered in jan.1958 to Western Airlines (as N93125). Iran Air started operating it as EP-AEW in sep.1965, but it got its present tailnumber N28CA when it was registered to Concare Aircraft Leasing Corp. in mar.1973. 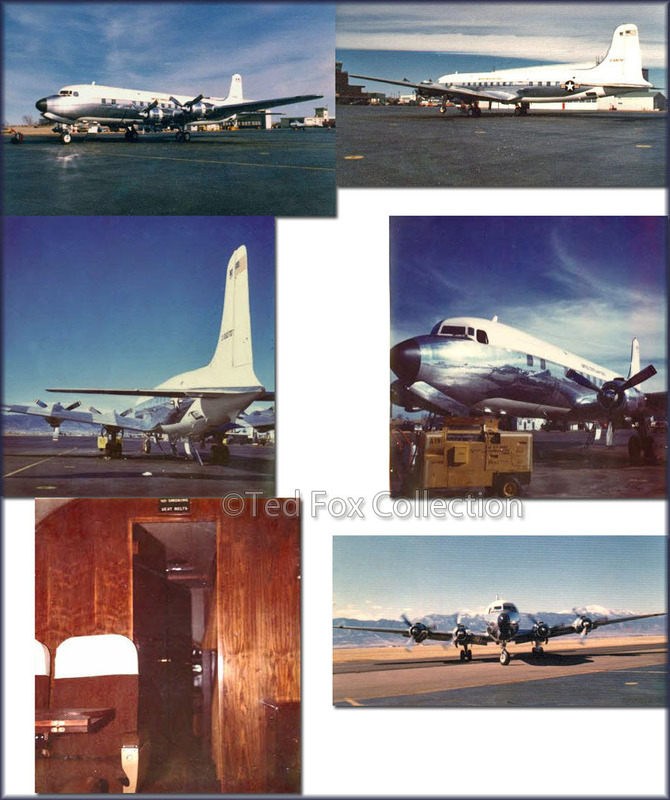 It was converted to DC-6BF (the improved DC-6 passenger-version to freighter) that same year and F.A. Conner (famous resident at Miami Int'l Airport for many years) started operating it as such in june 1973. This shot was taken by me in 1995 at Palmer,AK where it was operated by Woods Air Fuel on a lease from Conner. Woods Air Fuel is affiliated with Woods Air Service, which folded in 2000. Lock, stock and barrel were offered on an auction jan.2001. Tatonduk Outfitters Ltd of Fairbanks,AK took ownership of N28CA upon the demise of Woods Air and registered it to its name on 25Sep01. Tatonduk did business as Air Cargo Express, which changed its name into Everts Air Cargo in 2002. Douglas made some versatile aeroplanes...! 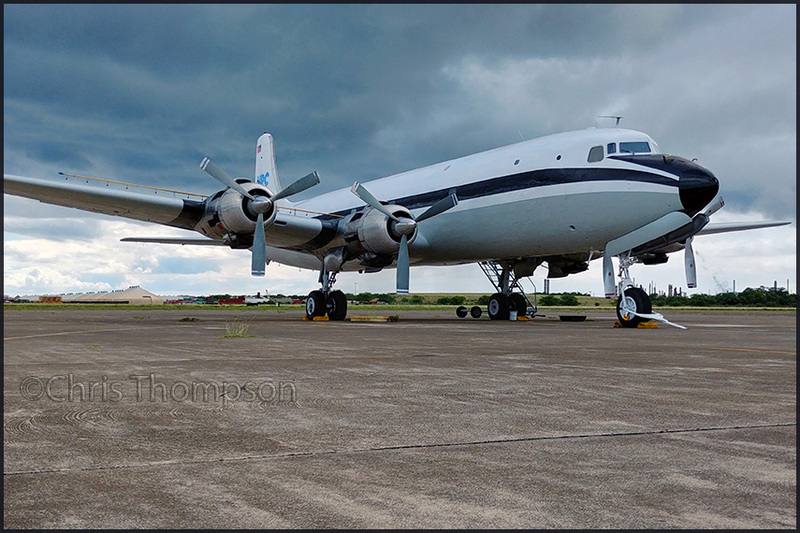 N434TA (cn 44434/515) is a DC-6BF/ST, ST for Swing Tail, which is obvious in this shot. Life started normally enough, with Western Air Lines in oct.1954 as DC-6B N91310. The Los Angeles Dodgers bought it feb.1961 and reregistered it as N180R in dec.1954. Thru Air Carrier Service Corporation in oct.1963 it went to Colombia as HK-1029, operating for Taxader Colombia (dec.1963). Two years later it went back to the US, registered as N12810 for Trans-Am Aeronautical and in aug.1965 for Charlotte Aircraft Corporation. It moved on to another continent immediately, to Europe, where it was bought by Spantax. It operated there as EC-BBK. In Belgium it was converted to the Swing Tail freighter configuration. Aero Uranus, probably a broker, bought it in jul.1975, while Zia Equipment was registered as owner that same month and put tailnumber N434TA on it. And Zantop started a lease as operator with it, again that same month. Confusing or what ? Anyway, Northern Cargo took it to Alaska in march 1987 and has been using it ever since. This photo was taken in august 1995, while its configuration was put to good use while loading these long telephone poles at Fairbanks,AK. I wrote some background info on the Douglas Swingtails, check it out. See my page JUNE 2012 FAIRBANKS to see it still around, although stored and for sale for years. UPDATE: N434TA was purchased by Buffalo Airways and flown to Yellowknife and on 26June13 seen parked at the Buffalo Airways hangar. UPDATE (FEB.2017): After N434TA had arrived in Hay River in 2013, it was subsequently stored at Hay River for Buffalo Airways; see this Flickr link to a 28May 2016 photo. Cargo: nothing romantic about it. Plain styrofoam is loaded here in N251CE, a C-118B (ex/ C-118A, cn 44612/532) of Everts Air Fuel. Except for fuel there is some space to load some cargo and in Alaska you can put styrofoam to good use: the long winters here on the Last Frontier put demands on insulation in construction. This old, tired workhorse saw better days though. It was delivered to the US Air Force as C-118A 53-3241 in dec.1954 and got transferred to the US Navy as BuNo. 153693 in june 1965 and was redesignated C-118B. No doubt it was put in the desert for storage for a while, but Everts has been operating this aircraft since the early 1980s in Alaska. N233HP is another ex-military C-118A, but it has not been put to commercial use yet. Cn 44661/628 started life with the US Air Force as 53-3290 in oct.1955. Almost 10 years later, in 1964 it was transferred to the US Navy as BuNo.152689. Stored in the desert of Tucson, Arizona (Davis Monthan Air Force Base) in 1983, it was soon picked up by Hawkins and Powers of Greybull, Wyoming in june 1983.... only to be parked in the desert there ! But it sure looked good when I took this shot in 1994 and I thought an operator would have picked it up... alas, it was the McClellan AFB Museum of California that purchased it in 1996. Destined to sit still, idle, the impressive Double Wasp engines silent for ever...? Not so! Hawkins and Powers closed shop in 2005 and put all aircraft up for sale. N233HP was bought by Everts Air Cargo, thought for spares. See for a Jan.2007 image @Rick Patton's gallery. Then it left KGEY in Oct.2007! It went though serious overhaul, made operational for Everts Air Fuel and indeed seen as such, reregistered N747CE, in 2009! Apparently it is not conclusive when these C-118s were phased out from the US military service; Bill Larkins offered the following data: "the official -United States Naval Aviation 1910-1995- from the Naval Historical Center lists "Last Reported in Squadron or Inventory" for the R6D/C-118 as VR-3 in October 1983. He continues with: "It also gives the date of first contract as August 18, 1950 and date of last delivery as May 27, 1953 with a total of 65 delivered.". But a US Navy website www.vpnavy.net/vr46_history states In February 1985, the last C-118 aircraft in military service was retired by VR-46 as the squadron transitioned to modern DC-9 jet aircraft..
"BuNo.131597 was the very last C-118 flown by the USN. It last operated with VR-46 from NAS Atlanta (VR-46 moved to NAS-JRB Ft. Worth in Sep09, with C-9B’s). The last flight was to Tucson in Feb85. I was in the squadron and have a few hundred hours in that particular airframe. I don’t recall there being a VR-3 in existence at that time, but I could be wrong. As far as I knew, the Naval Air Reserve operated all the VR (transport) squadrons, with the exception of the VRC squadrons, which flew the C-2A." Well, at least this operator thought its 'Six' deserved a nice coat of paint. N70BF (cn 43720/373) is a C-118B and is shown operating for Florida Air Transport. Miami and the airports in the vicinity like Opa Locka, New Tamiami, Ft.Lauderdale-Hollywood and Ft. Lauderdale-Executive have an ideal location for travel and cargo operations to South America, the Caribbean and of course North America. All sorts of operators are here to be seen, large or small. Florida Air Transport was founded in 1997 and making money in their market is a struggle for survival. This C-118B (originally designated R6D) was delivered to the US Navy in may 1953 as BuNo.131617 and operated faithfully till 1986. It was preserved at Scott AFB,IL but in 1989 Basler Flight Service thought this old lady to be too young to retire and bought it. Many senior US citizens found their way to Florida, I guess this old lady found its way down south too and she fits right in ! "I knew this plane when was sitting idle at Scott AFB in the 1980's. I was first assigned there in Feb 1988, and I immediately took notice of her sitting in the middle of a parking lot near the guard and reserve area of the base. Over the course of a few weeks, I would park my blue 1987 Mustang ever closer at lunch time. eating in my car and seeing if I was attracting the interest of any security police patrols. Seemed that no matter how close I parked, passing patrols would just keep on driving by. One day I parked near her wingtip and got out after eating and walked all around her and then even under her. Birds were nesting in every crevice they could find, but other than that, she seemed to be in pretty good shape. I came to find out that this plane was flown to Scott to be repainted in USAF colors and put on display as one of the first Air Force medivac planes. For whatever reason--probably most simply lack of funding--this never happened, so she sat there in that parking lot for years deteriorating. I was fascinated with that plane and the fact that she was sitting out there in the open in full access of anybody. And I eventually fashioned a rope and wooden rung ladder that fit inside her tail cone access hatch and one night I dared to park nearby and fasten and climb the ladder and explore her cabin and cockpit in the dark. I recall my heart pounding as I realized that if I was caught, I would have been in deep trouble, even though I had the utmost respect for that plane and would never have done anything to cause her any damage! I was in fact saddened to find that some of the cockpit instruments were missing. Whether they had been stolen (probably) or stripped for re-use (doubtful), I had no idea. Other than that, her musty interior was in decent shape. Eventually, we got a new base commander, and when he took his first tour of his new base, he too immediately took notice of her sitting in the middle of the parking lot. Except unlike me, he saw her as an eyesore and ordered her off his base! One day I noticed a couple of vehicles were parked under her wings and a small group of men were walking her wings through her now-open emergency exit doors. Enter Basler Airlines. I stopped by and asked what was up. The guys there told me that the base commander had put word out that if anybody wanted this plane, they could have it if they could get it to fly away. So Basler sent this team of guys down and they spent several weeks checking it out. I got to know them and in fact they let me ride in the back of their pickup truck to videotape the first taxi tests. I still have that video, but it is on a VHS tape. The guys from Basler did a fine job restoring that plane. If I remember correctly, they had to replace one of the engines (no.2 I think), which is what took them so long to get it in flying condition. When they were ready to go, she took to the skies and ended her military career without any fanfare at all. I was sad to see her go. On the other hand, the aircraft enthusiast in me was glad to see that she would be returning to the skies instead of becoming a former plane on a stick. Anyway, I thought I would share my memories of that plane with you. Feel free to add them to your page. Thanks again for publishing that web page. It brought back some good memories." "In her Navy days, he was stationed at NAS Barbers Point, on Hawaii, with transport squadron VR-21, basically from the day she was accepted until the squadron was decommissioned in 1977. She spent her time here flying across the world, but primarily in and out of the Vietnam conflict area. In January 2018, she returned home to Kalaeloa Airport, the former NAS Barbers Point – sixty-five years since she was first here, and forty years since she left! Since the picture you have there, she’s been converted with spray nozzles above the wings, and storage tanks – in fact, old KC-97 fuel tanks – in the fuselage. Her current owners, National Response Corporation (NRC), have her assigned here to fulfill a contract to spray oil dispersant in case of an offshore oil spill. One of our museum volunteers was a kid here in the late 1950s, and his father worked as a crew chief on this very same aircraft! He now spends his time as her modern plane captain, lavishing much-deserved attention on her, and sitting in the very same seat his father did six decades ago." Rolf Larsson sent me this on 18Oct18: "I took the picture at Opa Locka on 09Mar09; the info was painted on the lower aft part of the fuselage. Interesting to see that it is now officially registered as a DC-6A, originally being a military R6D, later C-118B!" On my page DC-6 Technical the variants are explained, which you will also find on Wikipedia. The R6D-1 to C-118B was a simple administrive change in 1962 for aircraft types with the US military. From my page I quote 'The US Navy took delivery of 65 examples, designating them R6D-1. 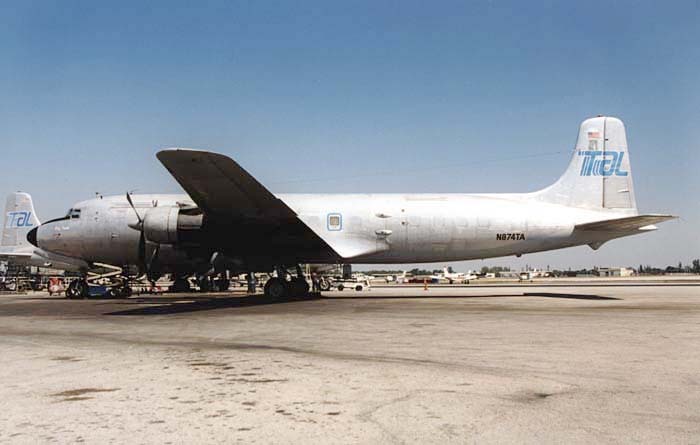 The US Navy redesignated them C-118B in 1962. The DC-6A was nicknamed 'Liftmaster', designed to haul freight. It us my understanding that the C-118B was designed to be able to change its configuration, from passengers to cargo and vice versa. From my own files I noted that in 2002 this C-118B was refurbished by Florida Air Transport (under same ownership as Florida Aircraft Leasing) with 'new' engines and fitted with a new cargo door. Its FAA registry notes its Certificate of Airworthiness dates from 06Sep2000, for the owner mentioned. 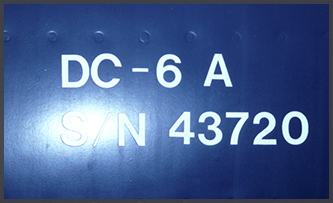 Its current type designation 'DC-6A' fully describes its use, as a freighter (but obviously still configurable for special purposes such as spraying oil despersants, as currently on contract for oil spill response operations). This was DC-6BF N55CA (cn 45328/825) and it was being cut up right under my eyes, a tragic sight. Having been delivered to Canadian Pacific Airlines as CF-CZU in june 1957, it was leased for some time to Pacific Western Airlines (1969) and was registered to Concare Aircraft Leasing Corp. in nov.1969 as N55CA. It was converted to DC-6BF before being bought by F.A.Conner in sep.1970. On this airport, Opa Locka, in the shade of Miami Int'l Airport, it is a survival of the fittest and N55CA did not belong to that group anymore, apparently. Xavier Macia has personal memories to this plane: "In 1960 I flew aboard the aircraft from Madrid, Spain, to Montreal, Canada, via Lisbon, the Azores and Gander, Newfoundland. As a CPA aircraft she bore the name 'Empress of Honolulu'. I often wondered what happened to her and now I know. Sad to see her to go like that." "My first 'long haul' flight was early in 1959 with an Eagle Airways DC-6C, from London (Blackbush) to Nicosia, Cyprus. It was a military flight which took 8 hours! How well I remember that flight, and what a splendid aircraft that was. In particular, I recall sitting on starboard, just ahead of the engines. The flight in brilliant moonlight across the Alps, to the drone of the 4 Pratt & Whitneys, with twinkling lights down in the valleys and snow on the mountains was truly memorable. Then, as the first rays of the morning sun came up over Crete, everything bathed in red, we flew along that island's south coast. Finally, as we approached Cyprus from the west, we flew in with snow-covered Mount Troodos on our right, I remember the island looked for all the world like a magnificent jewel with its setting the sea washing the coastline. That was a breathtaking flight for a 'rookie' flyer." The DC-6 is a rare bird in Europe ! Fortunately, there is Atlantic Airlines at Coventry,UK that take propliners to their heart. G-APSA is DC-6A (cn 45497/995) and is seen in the latest livery of Atlantic Airlines during the air show at Coventry aug.12th 2000. It was a unique event with pistons revving up all around you. G-APSA saw its "birth" a long time ago: delivered to Maritime Central Airways as CF-MCK in june 1958. G-APSA was assigned to it when it was registered for Eagle Aviation in sep.1958. It went to the desert for Saudi Arabian Airlines in feb.1964, where it flew with tailnumber HZ-ADA. It was graciously donated to Yemen Airways in 1971 and changed to 4W-ABQ. It was stored some time at Sana'a, Yemen before Air Atlantique bought it feb.1987 and registered it to G-APSA again. 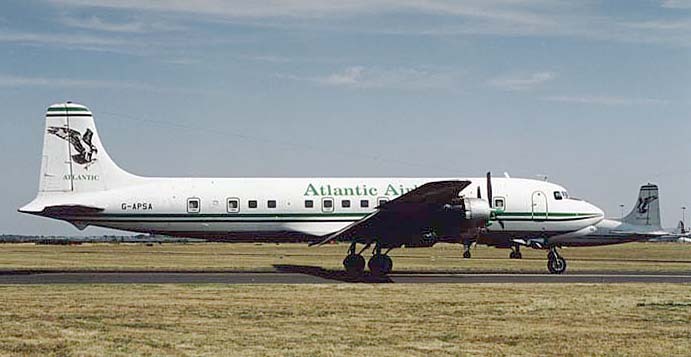 Air Atlantique named its commercial operations in Atlantic Airlines in 1999. And indeed, during 2006 it looked like Air Atlantique was storing both Sixes (G-APSA and G-SIXC) and putting them up for sale. Graham Robson did find an opportunity to make some fine air-to-air photos in 2006 before this took place. While G-SIXC is for sale, G-APSA isn't and "Sierra-Alpha" will be flying at Coventry on 14Dec06 at the Air Atlantique press day and later at Wellesbourne for a display practice; she will be ground running in January and flying again at the beginning of February, thank goodness. In fact, G-APSA still technically belongs to Instone, the world's oldest airline, and is not for sale. That DC-6 Diner did not get raving reviews and my visit in 2011 was not very positive either; it closed during Oct.2017 probably: an exact dat I have not been able to find). Credits: the Piston Engine Airliner Production List by TAHS (1991), contributed to most of the historic details of the aircraft described.